Have you ever bothered to ask why the richest people in the world still want more money? Life is full of expenses and as such, our wants are numerous but money; money seem to be very limited. No payday? No problem! You can borrow money without collateral from C24 Limited to foot your long list of bills. While this is not rocket science news to some people, it is definitely worth sharing to everyone out there. For some people, the fear of hidden charges makes them shun a scheme like this. For others, it is the high interest rate or inflexible repayment pattern. How about I show to you an exceptional website where you can take loans without collateral in Nigeria? To juice it up, they have been able to tackle all these ‘fears’ we have for such product. 3) Your repayment is automatically calculated as you slide/enter your values. Confirm this and Apply! 4) Fill the form that shows up, submit and your application will be processed. 5) You will be allocated an account officer who will guide you further till you finish paying up. 6) Once your application is complete and reviewed (usually 2-3 days), grin-grin- Alert!!! That’s it! In six easy steps, you have borrowed urgent cash without having to drop collateral. - How much is their interest rate? A: Interest rate is as low as 4%. This is one of the cheapest you can find in Nigeria. Any other charge could be 4% management fee which is only paid one-time at first repayment. Don’t worry, it is all summed up with the repayment already. - How long do I pay back? A:You can pay back from 3months – 6 months depending on your cash flow. C24 Limited boasts of giving hundreds of people loans without hassles. Truth is you don’t have to physically appear at the premises. When you apply for a loan, the company’s courier will come over to pick up some documents from you, which you must have been informed by your account officer. 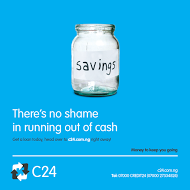 Never run out of cash in these trying times, opt to borrow money without collateral from C24 Nigeria already! Related Posts: Make Money Online.